Before I chose Lamb for our Easter feast, I was thinking Duck Dinner. 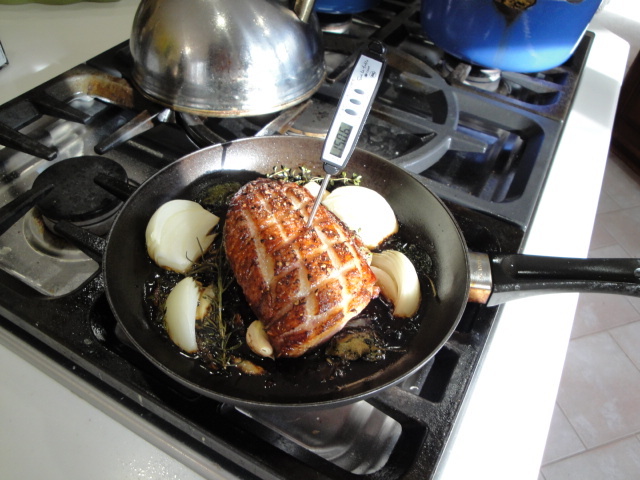 Like Lamb, Roasted Duck Breast is another of my go to’s for special occasion meals. For many years it was something I ordered in restaurants because I thought it was tricky to cook it well at home (not sure how I got that idea in my head)! Then I discovered how easy it was and it’s been on our festive list ever since. There was a point in time when great duck wasn’t so easily found in Columbus and I ordered it from that great purveyor of specialty meats-D’Artagnan. I like the fact that they are committed to free-range, natural production and sustainable, humane farming practices. And as with the great meat I get from Bluescreek Farms, the quality shows up on the fork. The shipping cost was a bit prohibitive, so it only made it to our table occasionally. However, as Columbus became more of a food town I was able to find great duck at North Market Poultry and Game in the North Market and then low and behold D’Artagnan fresh Margret Duck breast showed up in the meat case at Giant Eagle Market District stores. At $10.99 per pound it may seem a bit pricey for poultry, but one 1 lb. duck breast will easily serve 3 to 4 people as part of a Duck Dinner or 2 with leftovers for making “Peking” Duck Pizza (guess what next weeks post will be about). And then there’s that liquid gold, duck fat that comes as a by product of properly cooking a duck breast. So here we go! 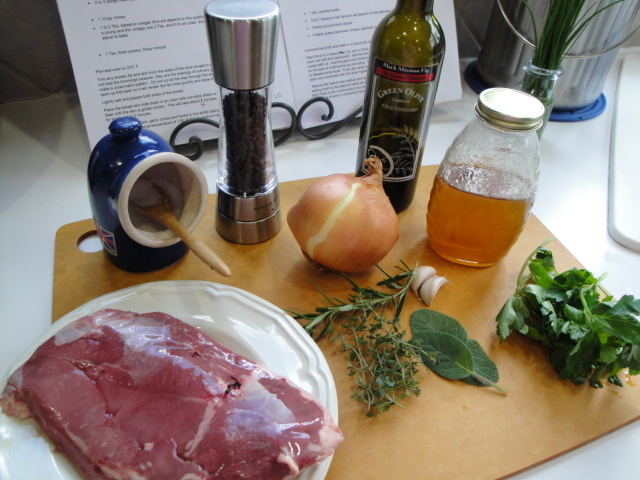 I think of this recipe as Scarborough Fair Duck as it utilizes that classic combo of Parsely, Sage, Rosemary and Thyme. Unlike the tale of the ballad however, the task of cooking this dish is the exact opposite of impossible. 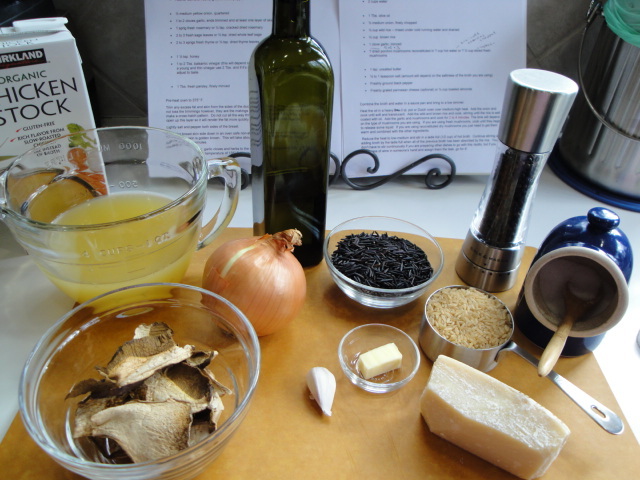 Also unlike the ballad which is English, the recipe has it roots in Italian cuisine and comes from Academia Barilla with just a couple of little tweaks. 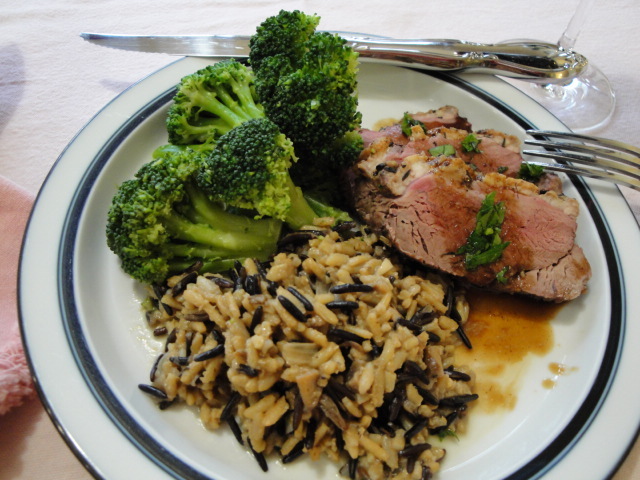 To pair with the Duck I often go with some type of Wild Rice as a side dish. Somehow in my mind Duck and Wild Rice go together. Perhaps it’s from watching ducks swimming around on the lakes of Northern Minnesota where the best wild rice is grown. The recipe here takes a slightly different tack on cooking a combo of rice types. The inspiration for the recipe comes from a Gourmet 2002 recipe for Wild Rice and Toasted Almond Pilaf. After making it once, as written and finding it a bit lacking, I took some of the suggestions by some of the 20 other reviews and punched it up a bit in flavor and changed the cooking method from pilaf to risotto technique. The cooking time wasn’t reduced much from the original (natural wild and brown rices just take time) but I preferred the finished texture. It’s not exactly like a classic risotto from Arborio rice because the starches are so different, but pretty darn tasty. Now the only thing to do before we start cooking is to stream some Simon & Garfunkel to put us in a Scarborough Fair frame of mind. We’ll start with the rice as it will take the longest time to prepare. I’m using Wild Rice and Converted Brown Rice. I’ve also made this dish with one of the Rice blends that are showing up in the bulk sections of many grocery stores these days. It was very pretty but I like the texture and flavor of the simple wild and brown best. 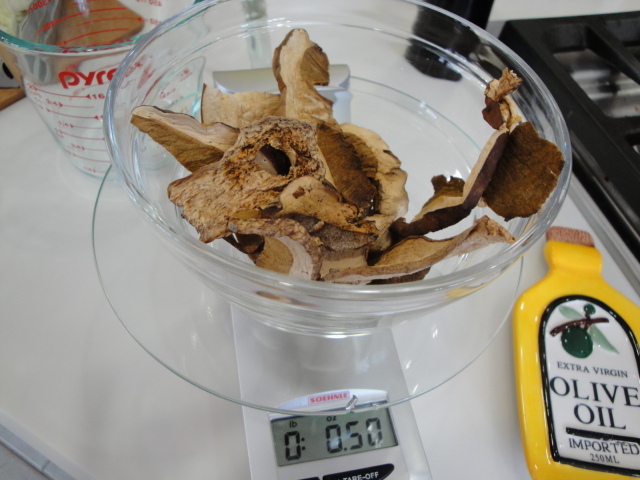 Start by soaking the dried porchini mushrooms in boiling water. I’m weighing them because I also buy these from the bulk section and depending on the size of pieces you have, a volumetric measurement would be off. But it’s not a critical amount, so if you don’t have a scale yet go for what seems right to you. Let the mushrooms soak for 10 to 15 minutes. While the mushrooms are soaking you can work on dicing the onions and mincing the garlic. 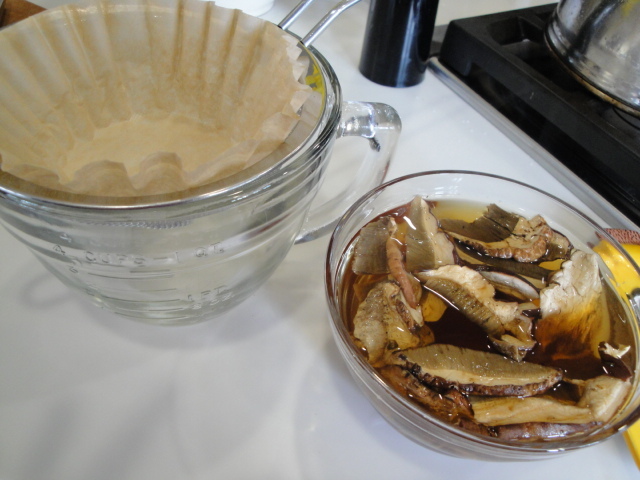 After soaking, the mushrooms should be soft and pliable and the soaking water a rich brown color. Transfer them to a mesh strainer lined with a coffee filter. If you don’t have either of these, no worries. Simply lift the mushrooms out with a slotted spoon or fork. The goal is to have grit free mushrooms and mushroom “stock” . Now your ready to start cooking. Heat olive oil in medium size heavy pot. Add chopped onions and cook until the onions are soft and translucent. 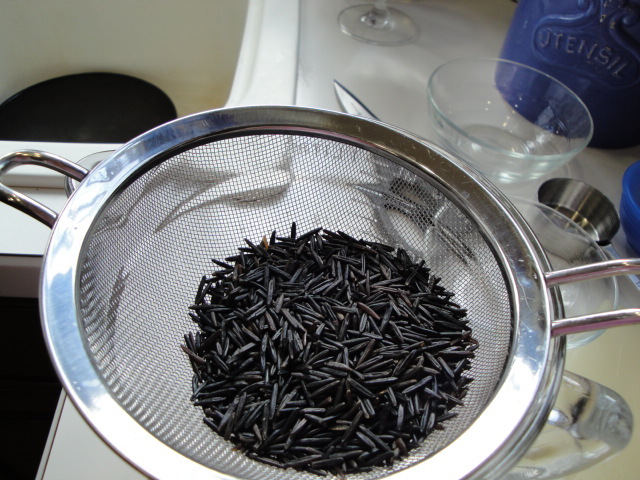 While the onion is cooking, rinse the wild rice. 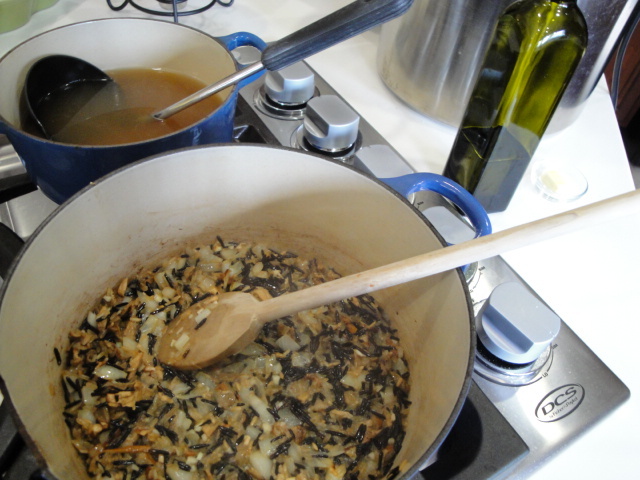 Add the wild and brown rice to the onions and cook, stirring until the rice is well coated with oil. Add the chopped mushrooms and minced garlic and cook for a couple of minutes. Turn the burner to low. 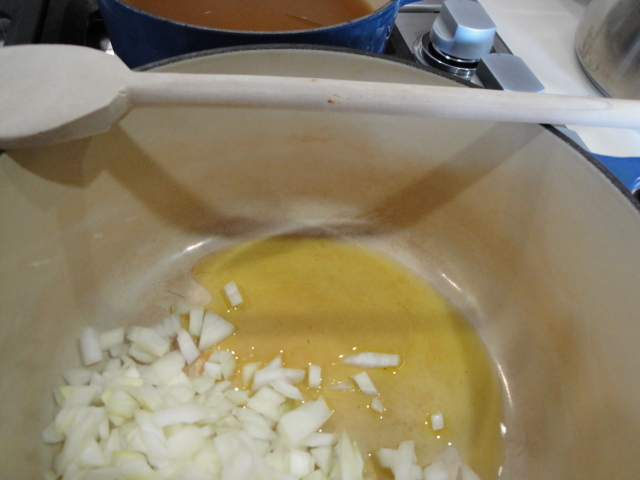 Add a ladle full (1/2 cup) of hot stock to the mixture and stir until the liquid is nearly all evaporated. Continue cooking and stirring and adding stock in this manner until the rice is tender but not mushy. You don’t have to stir constantly, but if you can put a glass of wine in someone’s hand and assign the task to them, go for it! It will take a good 45 minutes or so to cook the rice. 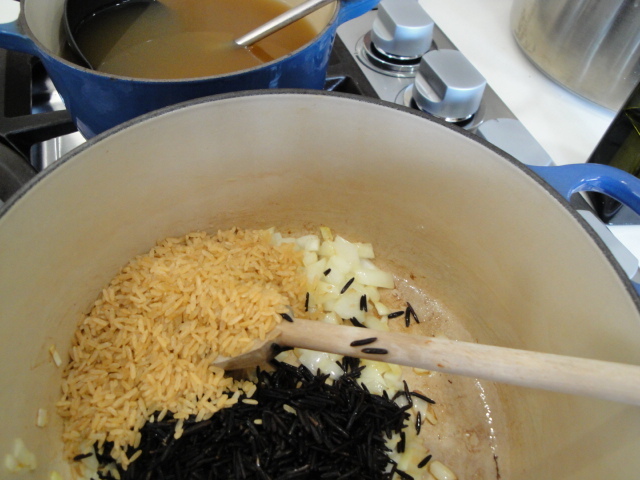 When you have added nearly all of the broth, add salt and pepper to taste and check the rice for doneness. If it still seems a bit underdone continue adding additional hot water in ½ cup increments. 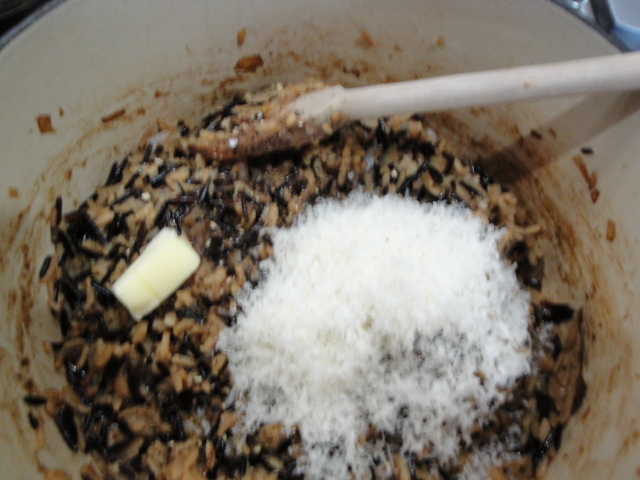 Once you’ve achieved the desired tenderness, stir in the butter and cheese and taste again for salt. Wow-sorry for the blur. The is the first time I’ve attempted to blog and put dinner on the table at the same time ;-)! You’ll be stirring this in as the duck is coming out of the oven if all goes according to plan. 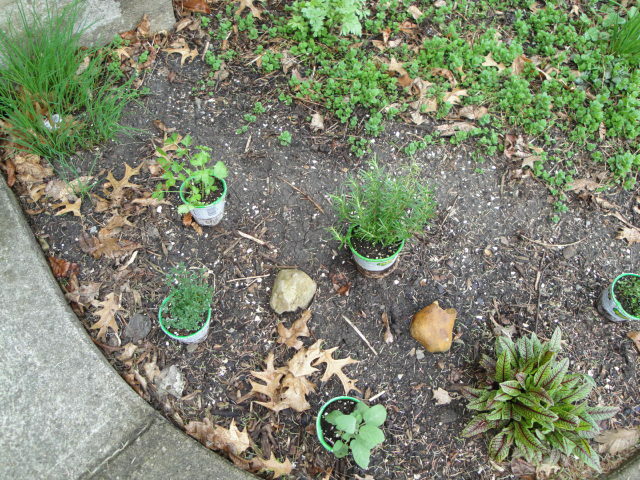 A simple set of ingredients and yeah it’s time to put in some fresh herbs by my front door. They won’t mind if I snip a few leaves for dinner. Pre-heat the oven to 375°F. This is going to come together fast. 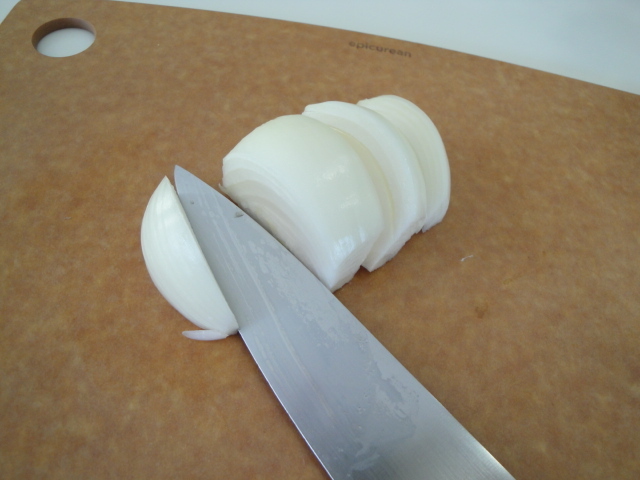 Cut the onion half into 4 pieces. 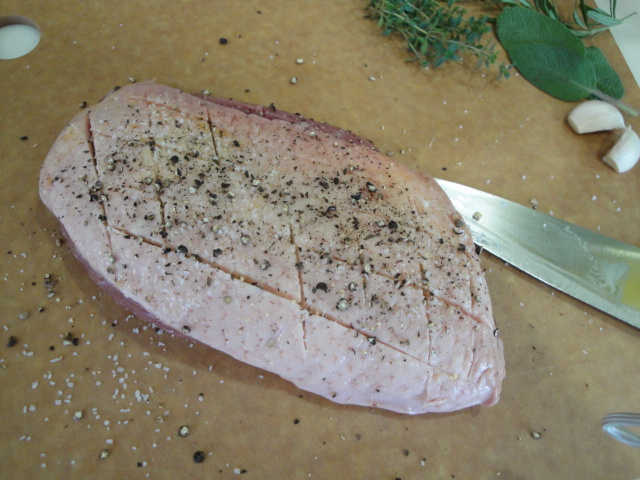 Lightly salt and pepper both sides of the duck breast and carefully score the skin to make a cross hatch pattern. Be careful not to cut all the way into the flesh. You just want to open up the fat layer so it will render more quickly and allow the meat to cook more evenly. 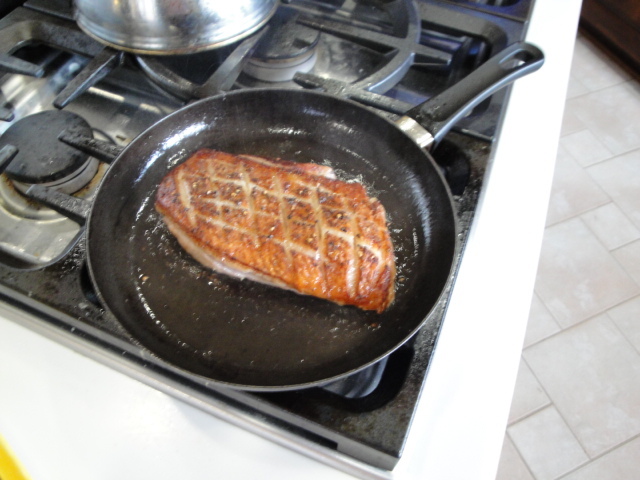 Place the duck breast skin side down in an oven safe skillet and place over medium-high heat and sear until golden brown. This will take about 4 to 5 minutes. Flip the breast over, turn the heat up a bit and sear on the flesh side for another couple of minutes. Scatter the onion, garlic (whole cloves with outer skin on), and herbs around the breast and put into the pre-heated oven for 15 to 20 minutes. Check the internal temperature. 135° to 140° F is what you’re looking for if you want medium-rare. 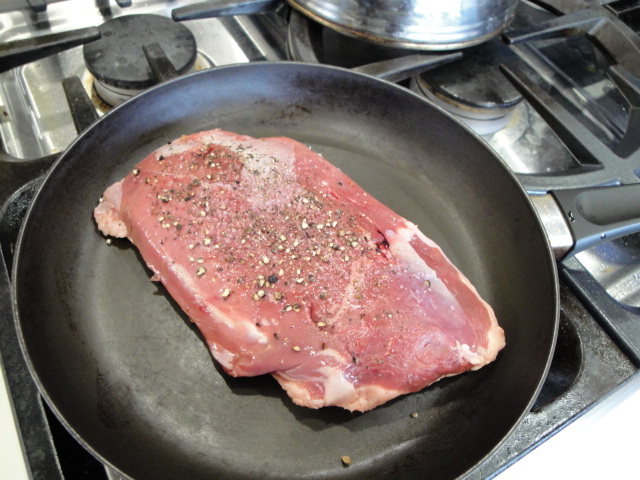 The official food safety word from the USDA is that duck breast should be cooked to 165°F. If you cook a duck breast to 160°F (assuming that carryover cooking will continue to raise the temperature to 165°F as the duck rests), it will be medium well—safe to eat and maybe a little pink in the center, but drier than I like. When cooking meat from a purveyor like -D’Artagnan, I’m comfortable with medium-rare. Remember the skillet handle is very hot–put a pot holder, dish cloth or one of those fancy pot handle covers on it. 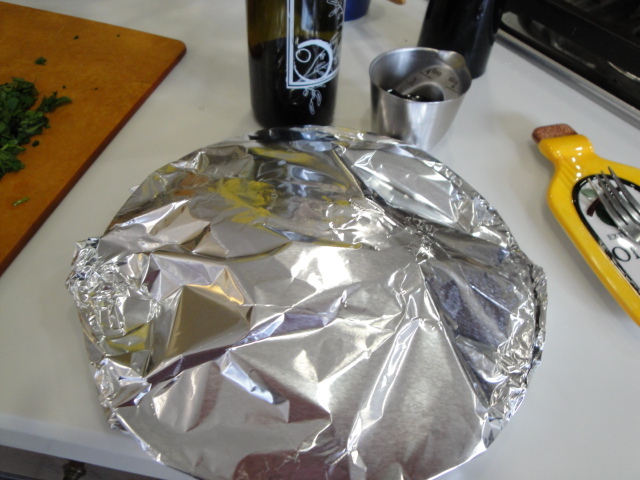 Remove the breast to a warm plate and tent with foil. Spoon out the excess duck fat and save for another day. Press on those garlic cloves to extract all of that yummy flavor. Heat until the sauce is slightly reduced and syrupy. The amount of time will depend on the age and thickness of the balsamic you are using. Strain the sauce by placing it in that fine mesh strainer you’ve been using for preparing this entire meal. Press down on the onions and herbs to extract all of their goodness. 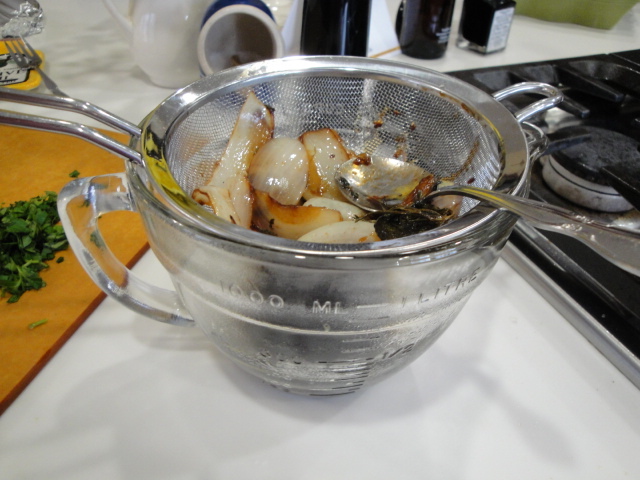 In the original recipe the stuff in the strainer would be discarded, but those onions roasted in duck fat are delicious, so feel free to pick out the herbs and send the onions to the table (if you can keep you family from eating them immediately) or save them for use in another recipe- i.e. pizza topping! Remove to rested breast from the foil and slice diagonally. Arrange on warm plates and drizzle with the pan sauce. I’d planned to serve this with steamed asparagus, but it’s still a bit early here in Ohio for local stuff and the imported at the market was sad. So microwave steamed broccoli it is. Soak the mushrooms in boiling water for 10 to 15 minutes. 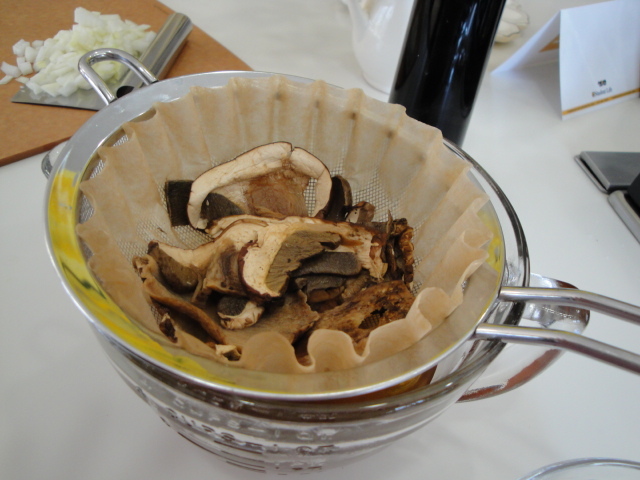 Once the mushrooms are soft and the liquid is a golden brown color, strain the mushrooms in a fine mesh strainer lined with a coffee filter or paper towel. Coarsely chop the mushrooms and set aside. Combine the mushroom soaking liquid and the chicken broth in a sauce pan and bring to a low simmer. Heat the oil in a heavy 3 qt. pot or Dutch oven over medium-high heat. Add the onion and cook until soft and translucent. 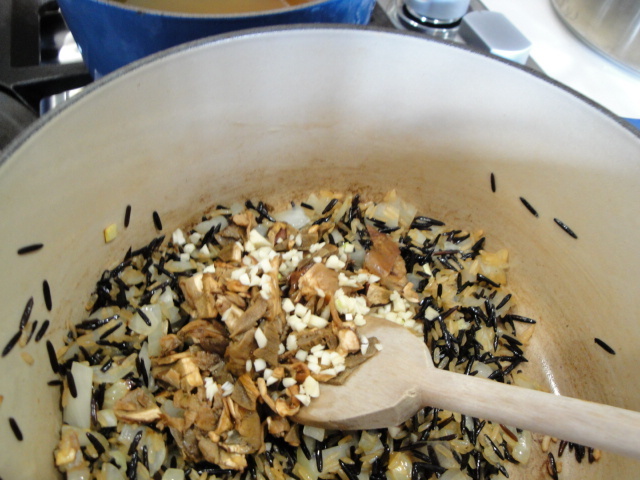 Add the wild and brown rice and cook, stirring until the rice is well coated with oil. Add the garlic and mushrooms and cook for 2 minutes. 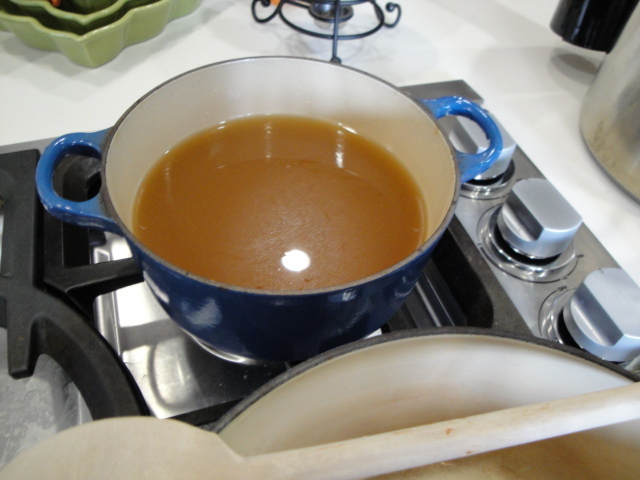 Reduce the heat to low-medium and stir in a ladle full (approximately 1/2 cup) of hot broth. Continue stirring and adding broth by the ladle full when most of the previous broth has been absorbed by the rice. You don’t need to stir continuously if you are preparing other dishes to go with this risotto, but if you can put a glass of wine in someone’s hand and assign them the task, go for it! When you have added nearly all of the broth (45 minutes minimum), add salt and pepper to taste and check the rice for doneness. If it still seems a bit underdone continue adding additional water in ½ cup increments. Once you’ve achieved your desired degree of doneness, remove the pot from the heat and stir in the butter and cheese or almonds depending on your preference. I make the call based on what I’m paring the “risotto” with. 1 to 3 Tbs. 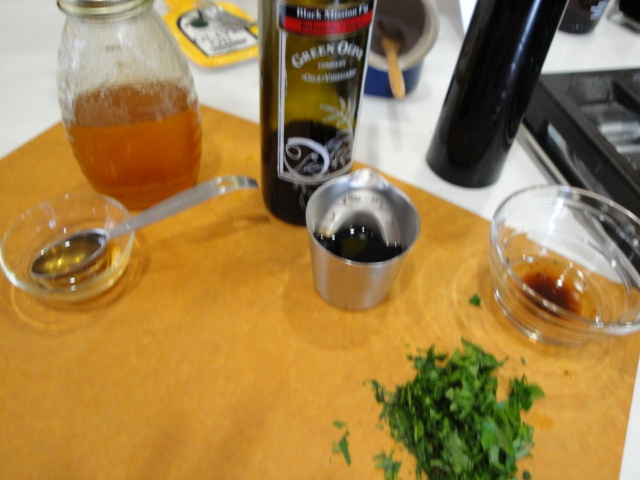 balsamic vinegar (this will depend on the quality of balsamic you are using-if it’s a young and thin vinegar use 3 Tbs. and if it’s an older, thicker vinegar start with 1 Tbs. and adjust to taste. 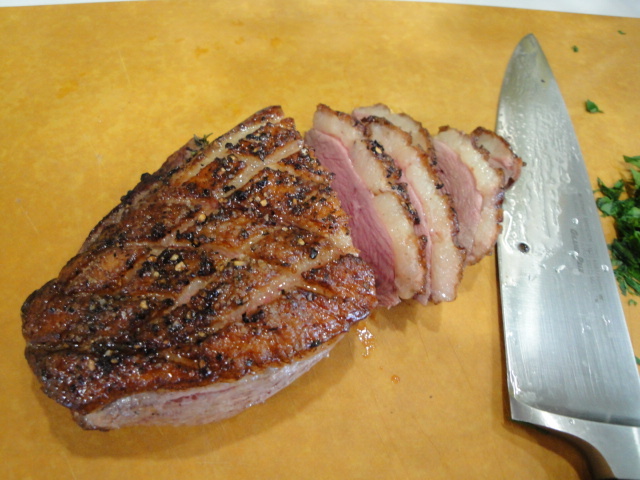 Trim any excess fat and skin from the sides of the duck breast to produce a nice, even shape. Do not toss the trimmings however, they are the makings of culinary gold. Carefully score the skin to make a cross-hatch pattern. Do not cut all the way through the skin into the flesh, you just want to open up this layer so it will render the fat more quickly and allow the meat to cook evenly. Lightly salt and pepper both sides of the breast. Place the breast skin side down in an oven safe non-stick skillet along with any trimmings and place over medium-high heat. Sear until the skin is golden brown. This will take 4 to 5 minutes. Flip the breast so the skin side is up and turn the heat to high and sear for another 2 to 3 minutes. Add the onion quarters, garlic cloves and herbs to the skillet and place in the oven for 15 to 20 minutes or to an internal temperature of 135° F (this is medium-rare so if you want it less pink inside roast it longer). 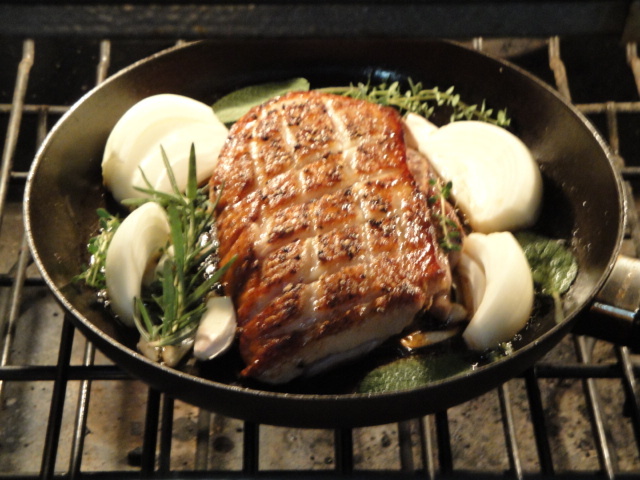 Once the duck is cooked, remove it from the skillet and wrap in aluminum foil to keep it warm and allow it to rest while you prepare the pan sauce. Remember the skillet handle is very hot-put a pot holder, dish cloth or one of those fancy pot handle covers on it. Spoon out and save the excess duck fat. You will want approximately 1 Tbs. left in the skillet. Smash the garlic cloves to get all that good stuff from the center. Add the honey and balsamic vinegar to the skillet and heat until the sauce is reduced slightly. The amount of time will depend on the type of balsamic you have chosen. Strain the sauce by placing it in a fine mesh strainer and pressing down on the herbs and onions to extract all of their goodness. 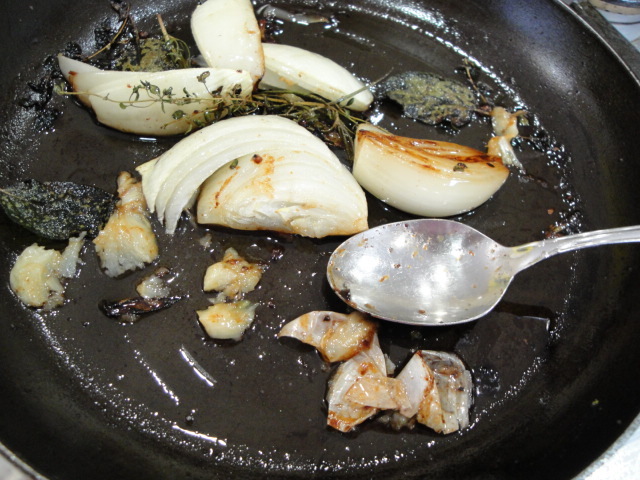 In the original recipe this would be discarded, but those onions roasted in duck fat are delicious, so feel free to pick out the herbs and send the onions to the table as well or save them for use in another recipe- i.e. pizza topping! 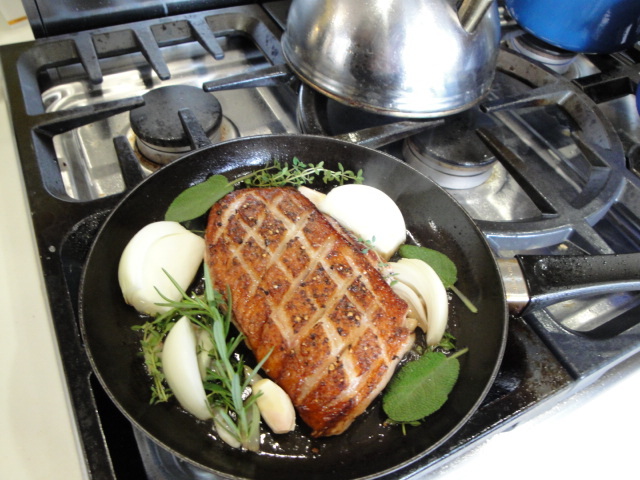 Remove the duck breast from the foil and slice diagonally. Arrange servings on warm plates and drizzle with the pan sauce and sprinkle with the minced parsley.